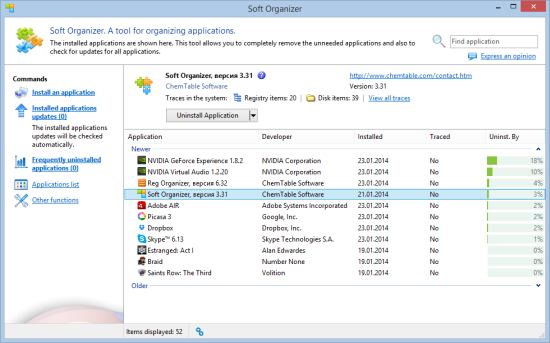 Soft Organizer allows you to completely uninstall programs from your system. It features a vast array of options that leads to a full, no-traces-left uninstallation of any application in the system. Additionally, the program features a user-friendly intuitive interface. » Soft Organizer – Family License (20% OFF) – 5 PCs. Category: Uninstallers. Tag: Chemtable Software. 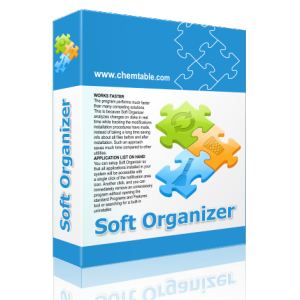 Soft Organizer is an excellent and very easy to use application to install and uninstall programs completely on Microsoft Windows XP – 8.1. Applications can be installed with tracking, which means the tool records all places in the system where the installed program leaves traces. In the future, these data allow removing that program completely, including all leftovers that may stay in the system after regular uninstalling using the Control Panel. Soft Organizer is also equipped with a search mechanism to find traces of programs that were not tracked automatically. This means that almost any program ever installed can now be deleted in full, thus preventing the cluttering and clogging of Windows with unnecessary files. For programs you prefer to keep installed, Soft Organizer can check for available new versions and notify you about them with a special symbol in the application list. Timely updating of installed programs allows you to avoid many issues, as new releases usually feature both new capabilities and critical bug fixes. The built-in rating system provides a way to locate and get rid of unneeded and low-quality products. Thanks to judicious selection of capabilities, Soft Organizer features only those options you really need in your work. The overall functionality of the program is similar to competitive application removal solutions. Due to the number of enhanced functions in Soft Organizer, experienced users can enjoy more precise control over the process. Such functions keep a low profile and do not distract other users, so installing and uninstalling applications using Soft Organizer remains simple and intuitive. 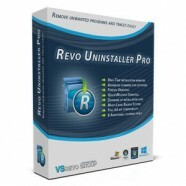 Allows you to remove traces of programs that were not tracked while installing (powered by the Full Uninstall technology). Installs apps and tracks changes in the system to enable removing tracked elements later (powered by the Full Uninstall technology). 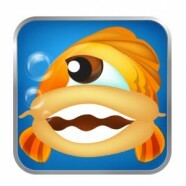 Program rating allows you to evaluate installed applications. The rating is calculated based on the total number of users who have removed this app from the computer shortly after installation. If the purpose of some program in the list looks vague, you can view its description by clicking the special question icon near the program title (not available for all programs). For installed programs there’s an option to check for newer versions of a program. This allows you to keep applications up-to-date, as well as to eliminate bugs and problems caused by the outdated versions. Automatic creation of restore points during the removal of application residues indemnifies the system against any possible emergency. 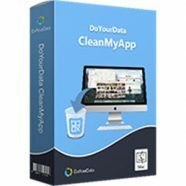 You can easily remove even multiple applications in Soft Organizer by simply selecting all programs you don’t need anymore and clicking “Uninstall”. For those setup packages that support silent install, you can install applications in the “no questions asked” mode in one click. When you contact the support staff of a company, they may ask you about the programs installed on your computer. You can easily get such a list in a few clicks. The list is saved as an HTML file that is easy to open and to read. The list of programs can be sorted by various parameters (install date, tracking status, title, and others) for instant search for given apps in the list. With quick search, you can find a desired application almost immediately, as long as you know its title or a portion of it. The list dynamically shortens as you type the text in the search box. The Agent allows you to detect if an installer is launched and initiate installation tracking without manually starting Soft Organizer. Soft Organizer automatically updates to new versions. You don’t need to visit the website of the program or download or install the tool manually. You simply click the Update button, and the program does the rest.